Prague has been nicknamed the "city of a thousand spires" for good reason: as you glance over its 1,100-year-old skyline, you'll be rewarded with splendid views of lovely domed churches and soaring old towers that combine to make Prague one of the world's architectural gems. Everywhere you look, fine examples of Gothic, Baroque, Renaissance, and Art Nouveau styles dot the city, providing a dramatic contrast to the sturdy old Prague Castle. Possessing one of the best-preserved historic city centers in Europe, the narrow laneways of Prague's delightful Old Town open up onto spectacular squares, each home to well-preserved historical buildings just waiting to be explored. Must-sees include the famous Charles Bridge over the Vltava River, the splendid Jewish Quarter with its old synagogues, and, of course, the city's many historic churches. Discover the best places to visit in this enchanting city with our list of the top attractions in Prague. Located in Prague's Hradcany neighborhood, Prague Castle (Praský hrad), once the home of Bohemia's kings, is today the official residence of the Czech Republic's President and one of the city's most visited tourist attractions. Originally built as a walled fortress around AD 870, the castle has changed dramatically over the years and contains examples of most of the leading architectural styles of the last millennium. Within the castle walls are a number of Prague's most popular tourist sites, including St. Vitus Cathedral, St. George's Basilica, the Powder Tower, the Old Royal Palace, and the Golden Lane. The largest castle complex in the world, this vast fortress requires considerable time to tour, but it's time well spent (particularly rewarding are the excellent views over the Vltava River with the old town and its many beautiful spires in the background). Highlights include the Old Royal Palace's main hall, the Vladislav Hall, so large it could be used for jousting tournaments, and staircases wide enough to allow mounted knights to use them. Be sure to also spend time in the Royal Garden, dating back to 1534 and home to a number of superb old buildings, including the Ball Game Pavilion, the Royal Summer House with its Singing Fountain, and the Lion's Court. The best way to fully explore the castle is on a Prague Castle Walking Tour. Also check the castle's official website for news and updates regarding cultural events, such as classical music concerts, lectures, and workshops. One of the top things to do at night in Prague is to find a good spot from which to enjoy the castle illuminations that light this magnificent structure in a range of hues. In fact, basing yourself in a hotel in the vicinity of Prague Castle is a good idea, so you can experience the city highlights by day and night. One of the most recognizable old bridges in Europe, magnificent Charles Bridge (Karluv Most) boasts 32 unique points of interest along its 621-meter span. Built in 1357, the bridge has long been the subject of a great deal of superstition, including the builders having laid the initial bridge stone on the 9th of July at exactly 5:31am, a precise set of numbers (135797531) believed to give the structure additional strength. For added good measure, it was constructed in perfect alignment with the tomb of St. Vitus and the setting sun on the equinox. The bridge is particularly famous for its many fine old statues. Among the most important are those of Holy Roman Emperor Charles IV and John of Nepomuk, the country's most revered saint, unveiled in 1683 (a more recent superstition involves rubbing the plaque at the base of the statue for the granting of a wish). Other highlights include spectacular views over the River Vltava and the structure's superb Gothic gates. Viewing Charles Bridge at night is also highly recommended (an added benefit are the smaller crowds, particularly after the spectacular sunset). A highlight of Prague's New Town (Nové Mesto) district—an area that grew out of the city's need to expand as it prospered—is the wonderful Wenceslas Square (Václavské námestí), home to the National Museum and numerous other architectural treasures. Named after the patron saint of Bohemia, whose statue can be seen here, Wenceslas Square was created in the 14th century during the reign of Charles IV as a horse market and has since become one of the city's most important public spaces, still used for demonstrations and celebrations alike. A visit today is a fun experience and undoubtedly one of the top free things to do in Prague, and will introduce visitors to some of the city's best dining and restaurant experiences, as well as great shopping. If you are visiting Prague in December, it's also the site of the city's largest Christmas Market. Fresh from a seven-year-long renovation, the National Museum (Národní Muzeum) in Prague is spread across a number of locations and houses numerous important collections representing a variety of fields, with literally millions of items covering mineralogy, zoology, anthropology, and archaeology, as well as the arts and music. The entomology collection alone numbers more than five million specimens. The oldest museum in the Czech Republic, it was established in the early 1800s before moving to its current location in 1891. Another museum to include on your must-visit list is the excellent National Technical Museum (Národní technické museum), which documents the many technological advances the country has contributed to, including displays of machinery and equipment built here over the years, from automobiles to aircraft. The Clementinum (Klementinum), one of the largest collections of historic buildings in Europe, is home to the National Library of the Czech Republic. These beautiful Baroque buildings were originally part of a Jesuit College, and later came to house the Jesuit book collection, as well as the collection from the Karolinum. The library eventually became the property of the state after the Jesuits were expelled, and the Clementinum became a public library in 1782 shortly after being constituted as the National Library. With more than six million books, the Clementinum's collection is huge and includes copies of every book published in the Czech Republic. A highlight is the exquisite Baroque Library Hall with its beautiful ceiling artwork, the 68-meter-tall Astronomical Tower with its spectacular views over Prague, and the splendid Mirror Chapel with its exquisite décor. English language guided tours are available and last approximately 50 minutes. For a truly memorable experience, the Clementinum is also used as a venue for jazz events, classical concerts, and festivals. The historic center of Prague, the Old Town (Staré Mesto) is where you'll find the splendid Old Town Square (Staromestské námestí), one of the best places to begin exploring the city. Here, you'll find the Tyn Church and the Clementinum, along with numerous other fine old churches, as well as splendid old architecture dating back as far as the 11th century, while the Jewish Quarter, Josefov, is just a short walk north. A highlight is the Old Town Hall (Staromestská radnice), home to the wonderful early 15th-century Astronomical Clock (orloj). Each hour, it springs to life as the 12 Apostles and other figures appear and parade in procession across the clock face. Other Old Town Hall highlights are the Gothic doorway leading to its splendid interior with its art exhibits and displays, a chapel built in 1381, and an old prison. Be sure to make the ascent (by stairs or elevator) to the top of the Old Town Hall Tower for its fine views over Prague. Situated within the grounds of Prague Castle, the Roman Catholic St. Vitus Cathedral (Katedrala St. Vita) is the Czech Republic's largest and most important Christian church. Seat of the Archbishop of Prague, it's also home to the tombs of numerous saints and three Bohemian kings. Founded on the site of a Romanesque rotunda built in AD 925, the cathedral was started in 1344 and took more than 525 years to complete, resulting in a mix of modern Neo-Gothic and 14th-century Gothic styles, along with Baroque and Renaissance influences (be sure to keep an eye out for the impressive gargoyles adorning the exterior of the cathedral). Interior highlights include stunning stained glass windows depicting the Holy Trinity, a mosaic from 1370 (The Last Judgment), and the St. Wenceslas Chapel (Svatovaclavska kaple) with its spectacular jewel-encrusted altar with more than 1,300 precious stones. Also of note, although rarely displayed, are the Czech crown jewels (on average, they're exhibited just once every eight years). Be sure to make the climb up the cathedral's 97-meter main tower for splendid views over Prague. Visitors are also welcome to attend cathedral mass. One of Prague's most recognizable buildings is the Church of Our Lady before Týn (Kostel Matky Boí pred Týnem), often abbreviated to simply Týn Church. Unmistakable for its twin 80-meter-tall spires flanking each side of the building (each supporting four smaller spires), its main entrance is through a narrow passage past the houses obscuring its façade. Although completed in the 15th century, the church was altered numerous times through the centuries as the city's allegiances changed, and while interior renovations are ongoing, there's still much worth seeing, including numerous fine tombs, the superb Gothic northern portal with its Crucifixion sculpture, early Baroque altarpiece paintings dating from 1649, and one of Europe's finest 17th-century pipe organs. Afterwards, be sure to explore the 11th-century Ungelt Courtyard behind the church with its many fine restaurants and cafés. Another splendid old church worth visiting is the Baroque Church of the Virgin Mary with its famous statue of the infant Jesus, said to have been responsible for miracles and still a point of pilgrimage. Spread across some of the city's most important architectural landmarks, the National Gallery in Prague (Národní galerie v Praze) is home to some of Europe's most important art collections. The bulk of the collection is housed in the Veletrzní Palace (Veletrzní Palác), a relatively modern structure built in 1925 that holds the 19th- to 21st-century works. While there's a strong emphasis on Czech artists, foreign artists such as Monet and Picasso are included, as are other art forms such as photography, fashion, applied arts, and sculpture. Other notable works are held in the Kinsky Palace (Palác Kinskych), home to Asian art, art from the ancient world, and the gallery's Baroque collections, and at the Convent of St. Agnes of Bohemia, where you'll find European art from the Middle Ages. Finally, the splendid 17th-century Sternberg Palace (Sternbersky Palác) houses some of the gallery's most famous pieces, focusing on European art from the Classical era to the end of the Baroque period and including important ancient Greek and Roman pieces; 14th- to 16th-century Italian masterpieces; and 16th- to 18th-century works by artists such as El Greco, Goya, Rubens, van Dyck, Rembrandt, and van Goyen. The Prague Municipal House (Obecní dum) is widely considered one of the finest examples of Art Nouveau in the city. Built in 1912, this splendid civic building is also home to one of Prague's most important (and largest) concert venues, Smetana Hall, and boasts numerous striking features, from its sumptuous façade with a large mural on the arch above the second floor balcony, to the large dome that rests behind and above the arch. The interior is equally impressive and includes many fine stained glass windows and important paintings. While English language guided tours are available (including a chance to see otherwise closed ceremonial rooms), one of the best ways to enjoy this landmark is to take in a concert or sample its café, restaurants, and luxury boutique shops. Opened in 1931, the superb Prague Zoo (Zoologická zahrada hl. m. Prahy) is not only one of the top tourist attractions in the city, it also ranks among the world's top zoological parks. Located in the Troja suburbs just a short distance north of the city center, this 140-acre attraction is an especially fun outing for those traveling with kids. Highlights for younger children include a fun petting zoo, which offers pony rides and opportunities to feed the animals, and a large adventure playground. Along with its more than 4,200 animals representing some 650 species—including many considered close to extinction—the zoo is notable for its role in saving the native (and endangered) Przewalski's horse. Highlights include a chance to ride a chairlift with great views of many of the animal enclosures, a huge giraffe exhibit, the superb salamander display, and the steamy indoor tropical jungle. Be sure to check the zoo's website for other details, including feeding times. English language guided tours and educational workshops are available. On-site dining is also offered, as well as a gift shop. Prague's Jewish Quarter was originally located in the Castle District, but by the 1200s had spread to the city's Josefov area and was for centuries regarded as a ghetto. Its transformation into one of the city's most important and interesting districts took place in the late 1800s, when large sections were demolished to make way for Art Nouveau apartment buildings. Today, Josefov is a pleasant area to stroll around and includes the Jewish Museum in Prague (idovské muzeum v Praze), an important attraction that consists of the Maisel Synagogue, the Spanish Synagogue, the Pinkas Synagogue, the Ceremonial Hall, and the Klaus Synagogue. One of the top free things to do in Prague is to explore the Old Jewish Cemetery, notable for its weathered tombstones, many leaning in a disorderly fashion due to their age. Josefov is also popular for its great kosher restaurants, too. The Strahov Monastery and Library (Strahovsky kláster) dates back to the 12th century and is the second oldest monastery in Prague. While its imposing gateway and churches are impressive enough, its most important buildings are its two beautifully decorated Baroque libraries. The Philosophical Library contains a variety of extraordinary furnishings, along with an exquisite ceiling painted by Franz Anton Maulbertsch entitled Enlightenment. The second library, the Theological Library, consists of a splendid Baroque room with a beautiful ornate painted ceiling by Siard Nosecky, a Strahov Monk, along with superb ceiling frescoes framed by detailed stucco work. The libraries contain many rare old volumes and manuscripts, including the famous 9th-century Strahov Gospel, while in the cellars are old printing presses along with the remains of St. Norbert, founder of the Premonstratensian Order. Also of note are the cloisters, which house a religious art collection and treasury, as well as the fascinating Strahov Cabinet of Curiosities, notable for its displays of historic artifacts from science. English-language tours are available. If you want to linger a little longer, consider dining at the Great Monastery Restaurant, or participate in one of the daily masses. Named after the hill on which it stands, the 63.5-meter-high Petrín Lookout Tower (Petrínská rozhledna) is a little like a smaller version of the Eiffel Tower in Paris that offers panoramic views over Prague. Although only a fifth the size of its French counterpart, the tower's elevation creates the illusion that it's bigger than it actually is. Built in 1891 for the Prague Exhibition from disused railway tracks, it was later moved to Petrín Hill in the 1930s, where it became one of the city's major tourist attractions. Today, visitors can either make the 30-minute climb up the Petrín hill to the base of the tower or take a leisurely trip aboard the funicular railway before tackling the structure's 299 steps to the top (there's also an elevator, as well as a café). Be sure to visit the nearby Mirror Maze, a fun diversion also built in 1891. Perhaps one of the city's most unlikely attractions, Prague's Lennon Wall has stood since the 1980s as a tribute to former Beatle and peace campaigner John Lennon. Things got started almost immediately after the singer's murder in 1980, when this otherwise unassuming wall near the Charles Bridge became a place for fans to demonstrate their grief, painting pictures, lyrics, and slogans attributed to the star. Despite police efforts to erase the graffiti—Czechoslovakia, as it was then, was still under communist rule—the memorial wall kept reappearing, and the site became a symbol of hope and peace for the city's population. The tradition continues to this day, and along with gatherings on the anniversary of Lennon's death, tourists can frequently be observed adding their sentiments to the wall. On picturesque Little Quarter Square in the Old Town area stands St. Nicholas Church (Kostel svatého Mikuláše), one of Prague's newer churches. Built by Jesuits in the 18th century, it's a fine example of High Baroque and is notable for its splendid interior with its unique 19th-century chandelier, as well as the large Baroque paintings by Czech artist Karel Skreta that adorn the huge cupola. Of particular note are the church's two historic organs, the oldest of which was built in 1745. The church also features a bell tower, which visitors are permitted to climb, from the top of which are great views over the church's huge dome and the old city. Try to time your visit to coincide with one of the regular organ concerts held here, including Mozart's Requiem and other notable classical pieces. English language guided tours are available. Idyllically perched on the banks of the River Vltava, Prague's National Theatre is a must-visit for lovers of the performing arts. Home to the country's top opera, ballet, and drama performances, the National Theater was opened in 1881 as a symbol of Czech national identity and to promote the Czech language and culture. Despite a somewhat checkered past that saw the building destroyed by fire and even closed by the communists, this stunning theater has undergone extensive renovations and stands as a monument to the city's rich talent and cultural significance. (English language guided tours are available). Another Prague theater of note is the Estates Theatre (Stavovské divaldo), built in the late 18th century in Neoclassical style and once a favorite of Mozart, who chose to premier Don Giovanni here. The Dancing House (Tancící dum), Prague's most outstanding modern architectural creation, was built between 1992 and 1996 to designs by Frank Gehry. Consisting of two adjoining towers, this splendid structure features unique curves that resemble two dancing figures, an effect heightened by the fact one of the towers is shaped like a woman wearing a skirt (hence the nickname "Fred and Ginger" after famous American dancers Fred Astaire and Ginger Rogers). While the building consists largely of offices and a hotel, great views can be enjoyed from the top floor restaurant (a café is also located on the main level). Looking like something out of a fairy tale, the Vyšehrad fortress—literally translated as the "Upper Castle," or the "Castle on the Heights"—stands high above the Vltava River overlooking Prague. Known to have been in existence as far back as the 10th century, it has long been the subject of myth and legend, including the foretelling of an ancient princess of the rising of a great city around it. Once the royal residence of Vratislav II, Vyšehrad also played a role as part of the original Royal Route taken by kings about to be crowned, who would have to stop here to pay tribute to their predecessors (the route led from Vyšehrad to Hradcany). Although now largely ruins, the fortress is a wonderful place for a stroll or picnic and offers superb views of the surrounding city. During the summer months, the attraction's open air theater hosts musical and theatrical performances. English language guided tours can be arranged. Created in 1680 to accommodate Prague's many plague victims, the Olšany Cemetery (Olšanské hrbitovy) served as the city's main burial ground for centuries and is the final resting place of countless victims of disease and war. Large enough to hold an estimated two million graves and divided into sections, the graveyard consists of the Jewish Cemetery, which includes the grave of writer Franz Kafka, and the Christian Cemetery, where you'll find the final resting place of a more recent notable Czech, Jan Palach, who set himself on fire in 1968 in protest against the Soviet invasion. Although his body was taken from Olsany Cemetery in 1973 to prevent his grave from becoming the site of organized protests, his coffin was returned in 1990. Despite its somewhat morbid history, it remains a wonderful place to explore due to its many mysterious old tombs and Art Nouveau monuments. Luxury Hotels: The sumptuous boutique Alchymist Grand Hotel & Spa, in a 16th-century Baroque mansion, lies only a short hop from Prague Castle and the Charles Bridge, while Hotel Residence Agnes lavishes its guests in a superbly restored historic building only 600 meters from the Old Town Square. 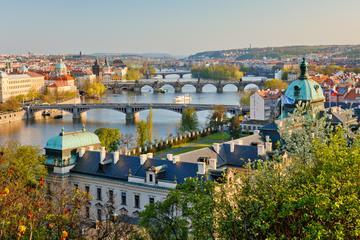 Also in Prague 1, the elegant Four Seasons Hotel Prague overlooks the Vltava River just steps away from Charles Bridge. Mid-Range Hotels: In a quiet location near Prague's largest park, the boutique Questenberk offers beautiful views of the city and Strahov Monastery and sits only a short stroll from Prague Castle. Across the river, a five-minute walk from lively Wenceslas Square, the Design Hotel Jewel Prague is a popular mid-range option with its heritage-listed gold-painted ceiling and thoughtful personal touches. If you're seeking the facilities of a chain hotel close to tram and metro stations, Prague Marriott offers a swimming pool and gym and lies a short stroll from the Old Town Square. Budget Hotels: To save money on accommodation, it's worth staying a little farther away from the main tourist areas. Close to a tram stop, Aparthotel City 5 offers modern apartment-style accommodation a 10-minute drive from Prague Castle. Other popular budget options include Miss Sophie's Hotel and the modern B&B Hotel Prague City. Both lie about a 20-minute walk from the Old Town Square. Sightseeing Tours: For first-time visitors, taking a tour of the city is a great idea. This is a good way to see the layout and learn some of the history. A worthwhile introductory tour is the Prague in One Day Sightseeing Tour, a popular 3.5-hour guided tour with coach transport and a walking tour of some of the city's most famous landmarks, including the famous Prague Castle. Day Trips: If you have time for only one day trip and have not already been to this UNESCO World Heritage-listed town, the Cesky Krumlov Day Trip from Prague is a must-do. This is an all day tour, with a scenic drive through the countryside and plenty of time to explore this beautiful medieval town. The Kutna Hora Day Trip from Prague is a six-hour excursion and includes a visit to the famous Sedlec Ossuary, known more commonly as the Bone Church, ornately decorated with human skulls and bones. 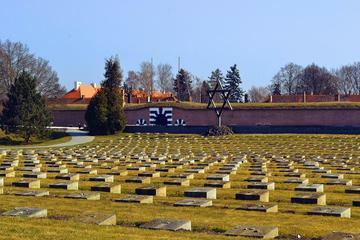 For a different type of historical road trip, the Terezin Concentration Camp Day Tour offers a chance to see this WWII camp and the Terezin Memorial. This is a five-hour tour that includes transport to and from the site. Czech Republic Travel Ideas: While Prague is an obvious choice as a base for your Czech Republic vacation, be sure to spend time exploring the rest of this amazing country. Other notable destinations include Karlovy Vary, established in 1358 and popular for its historic buildings and thermal hot springs. The walled city of Cesky Krumlov is also worth visiting, especially for its castle and churches, as is old Brno, the country's second largest city. Crossing Borders: An easy two-hour rail journey from Prague will bring you to the historic German city of Dresden, home to exquisite Baroque architectural gems, such as the spectacular Frauenkirche cathedral. Also worth a visit in Germany is the city of Leipzig, popular for its historic old squares, city hall, and wonderful shopping and dining experiences.